It is a truth universally acknowledged, that a Christchurch citizen in possession of a motor vehicle must be in want of a bus. However little known the feelings or views of such a citizen may be, this truth is so well fixed in the minds of the council, that the citizen is considered as the rightful property of one or other of the bus companies. Accordingly, citizens will lose nearly half (105) of the parks in Madras and Barbadoes Streets, 115 of 549 parks permanently on the Papanui Rd bus lane route and 323 parks in the afternoon peak period. Citizen's losses include 23 parks outside St Margarets, 22 outside Merivale Mall, 13 outside St Georges in bus lane hours, 56 outside St Andrews, and 47 outside the Papanui shops in the afternoon peak period. In addition, the Council has removed about 200 other Merivale parks over recent years, and forced through the Merivale Parking Plan with no mandate and against the express wishes of 1191 citizens including 554 residents. Contrast all this with the Council plan to build itself car parks using $800,000 of ratepayers' funds. It is sadly typical behaviour for a council full of environmentalists. Cars (which carry some 95% of Christchurch commuters) are bad, therefore we need to block the roads, remove the parking and subsidise buses. There is nothing unusual about this. What is unusual is the extent to which Christchurch ratepayers are willing to put up with it. The Environmentalists likely can't believe their luck. They have spent millions filling major arterial roads with concrete and paint to slow cars and speed buses, narrowed and blocked residential back routes to force traffic growth on arterials, reduced the patronage of hundreds of businesses, and banned thousands of residents from parking in their own residential streets. There is no purpose in any of this other than to make Christchurch a less convenient and easy city. Yet still they have jobs / remain in office. That is the real disgrace for Christchurch. Yes you read it right: a reputable car company has turbo-charged and super-charged a 1.4 litre engine. This is bad enough. But what madness might bring a civilised country to purchase such a thing? Handing over real money for a this Frankenstein of cars? The sensible thing to do would be to give the car a larger engine - say 2 litres or more. If more power is what you are after, a higher capacity is the quietest, smoothest, most fuel-efficient way of doing it. A tiny 1.4 litre engine, super-charged or not, is no to use to anyone at under 3000 rpms, and all the action is above 4000 rpms. Yes, why would anyone bother trying to make a 1.4 litre engine more powerful when there are perfectly good 2 and 3 litre engines around with all the power you need? Why would people want to drive to work at an average of 4000 rpm? Why would a company actually advertise that their car has such a small engine, as opposed to hiding it in the small print like sensible crowds? As Jeremy Clarkson might have mentioned once or twice, a lot of car advertising is aimed at gullible middle-class enviro-guilt. This car is no different. 'So what' if it actually uses more petrol than a proper car because you drive everywhere at 140km/h and 4000rpm? 'So what' if you only actually achieve the CO2 emissions figures as you carefully manoever the car into your pokey little garage? 'So what' if your noise emissions are driving all your neighbours around the bend? You have a crappy little car with an engine two sizes bigger than it looks. You are burning rubber and saving the planet at the same time. So my new name for England is Revland. I have pissed myself laughing at these crappy little cars so many times. Seldom has so much noise been made by so little cubic capacity to so inadequate a result. Wake up United Kingdom, your enviro-government is laughing all the way to the bank. For those who can spare the time (and I admit it might be few), travel to the other world and read Michael Moore's piece on the demise of GM. If you don't remember Michael Moore, he was a fierce critic of anything to the right of Stalin, and has created a number of movies about left causes such as socialised healthcare, gun control, George Bush, etc. Sort of like Al Gore, but with broader interests. He also wrote an entertaining book called 'Stupid White Men'. Anyway, Mr Moore's piece about GM is priceless on so many levels. His delusions are reaching the point where he really should be his own comedy show. Beginning in the 1980s, when GM was posting record profits, it moved countless jobs to Mexico and elsewhere, thus destroying the lives of tens of thousands of hard-working Americans. The glaring stupidity of this policy was that, when they eliminated the income of so many middle class families, who did they think was going to be able to afford to buy their cars? Perhaps even in the USA there are a few people who are not employed by GM? Yes GM employed 250,000 people, but there are 300m in the USA. If the job can be done more cheaply elsewhere, then perhaps this is a hint from the market that 100,000 auto workers could do something more productive. So here we are at the deathbed of General Motors. The company's body not yet cold, and I find myself filled with -- dare I say it -- joy. It is not the joy of revenge against a corporation that ruined my hometown and brought misery, divorce, alcoholism, homelessness, physical and mental debilitation, and drug addiction to the people I grew up with. So perhaps moving those jobs to Mexico was a good think? I'm just not clear whether working for GM Is good, or bad? Let's be clear about this: The only way to save GM is to kill GM. Well if that's as clear as it gets, I just hope he is not allowed near a medical patient. 1. Just as President Roosevelt did after the attack on Pearl Harbor, the President must tell the nation that we are at war and we must immediately convert our auto factories to factories that build mass transit vehicles and alternative energy devices. We are at war? Is this the war on terrorism? The war on drugs? The war on fat? The war on lame comedy? We are now in a different kind of war -- a war that we have conducted against the ecosystem and has been conducted by our very own corporate leaders. Ahhh, the war on global warming. I should have known. In fact the whole piece boils down to this. The greenies have some responsibility for killing GM (all their whining about fuel efficiency). The other front in this war is being waged by the oil companies against you and me. They are committed to fleecing us whenever they can, and they have been reckless stewards of the finite amount of oil that is located under the surface of the earth. So the oil companies hate us? 9. To help pay for this, impose a two-dollar tax on every gallon of gasoline. So the government hates us? How can it be fleecing when the oil companies work hard to sell us a gallon of petrol at a reasonable price, but good value when the government just charges us for doing nothing? Utterly clueless. 3. Announce that we will have bullet trains criss-crossing this country in the next five years. Japan is celebrating the 45th anniversary of its first bullet train this year. Now they have dozens of them. Average speed: 165 mph. Average time a train is late: under 30 seconds. The land area of the USA is nearly 10 million km2, versus less that 0.4 million for Japan. Japan is long and thin. Japan has a small number of urban centres with large populations. Japan is more than 10x as dense in terms of population overall, and a quick look around Tokyo or Osaka (a major bullet train link runs between then) will convince most observers that the cities are in a different league to Flint, Houston or Boston in terms of density..
Few would doubt that fast trains could be very handle in particular areas, perhaps on the east cost to link up a few cities. Still, what do you do at each end? Unless you live in a large city, you are going to want to drive home from the train station. The idea that trains will replace planes for flights between New York and LA seems far fetched at best. What doesn't Mr Moore just come out and say that he is pleased that GM died because it was interfering his precious environmental credentials? Or perhaps he did. For a real discussion about GM's demise, you could always try The Economist. I cannot understand why the British put up with such awful cars. They judder about on the poorly-maintained local roads, they have very little poke, and they are so small as to be uncomfortable for any more than two people. Drive out onto the M25 and you are treated with the hilarious sight of 10,000 people revving the crap out of their tiny micro-engines as they burn along at 80mph and 5000 rpms. Even worse are the eco cars. These have all the above problem, but also cost and weigh twice as much as they should. In terms of the precious 'earths' resources' that environmentalists witter on about, they are the equivalent (in battery / Nickel terms) of about 1000 laptops. Very eco-friendly indeed. Luckily, there is Jeremy Clarkson, who is on to this scam. His review of the Honda Insight 1.3 IMA SE Hybrid is worth reading from start to finish. you’d have to sit a dog on a ham slicer. The only hope I have is that there are enough fools and madmen out there who will buy an Insight to look sanctimonious outside the school gates. And that the cash this generates can be used to develop something a bit more constructive. Looking around I think Mr Clarkson can rest easy. There are absolutely masses of fools and plenty of madmen about. With the decline of knitting and morris dancing, people urgenty need an outlet, and it seems environmentalism is it. Exxon Mobil’s Azulao-1 well tapped a reservoir that could contain 8 billion barrels of recoverable oil, said Luiz Lemos, a partner at TozziniFreire Advogados, a Brazilian law firm that represents foreign energy companies with projects in the South American nation. At current energy prices, 8 billion barrels of oil is worth about $380 billion, which exceeds the economic output of Taiwan, South Africa and Ireland. The Brazilian prospects cover an area the size of the U.S. state of Florida about 170 miles (274 kilometers) offshore under more than 16,000 feet of water, rock and salt, Lemos said. The region will require $500 billion in investments over the next few decades for pipelines, production platforms, gas-processing plants and other infrastructure, he said. Wishful thinking that someone would spend $500 billion to extract $380 billion worth of oil, but South American bribes can be creative. On the other hand, the company involved has deep pockets. Exxon Mobil is spending $79 million a day this year to search for oil fields, construct platforms and renovate refineries. The company had $45.2 billion in profit last year, the highest in U.S. corporate history. Speaking as a pro-human and not an environmentalist, I can hardly wait. He [Senior Sergeant Rod Fraser of North Shore police] said in one location, on average, every 16th driver was over the legal limit and every fifth driver had consumed alcohol. But that means that in other less successful locations they must have stopped many hundreds of drivers to find one over the limit, or found none at all. I have been stopped at a random checkpoint only once, at 3pm on a Thursday afternoon. I can't imagine that the odds were that great then either. The officer I spoke to said they hadn't caught anyone yet. It seems like a lovely way to spend a sunny spring afternoon, hassling the sober public. The fact is that some people drink too much and drive home. From my experience it is more common in middle-aged to older people, many of whom are never caught because they live centrally and don't drive far to get home. I think the best way to get to these people is to remind them of the risk (to insurance, liability, prosecution) of an accident while they are over the legal alcohol limit. Despite all the advertising and police intrusions, which presumably show a desire to reduce drunkenness on the road, it is still true most people can crash their car, hurt several people and cause tens of thousands of dollars worth of damage and medical bills, and not have to pay for it. ACC picks up the tab. This lack of personal responsibility is probably the real reason for people taking the risk. Younger people and those with no assets can be expected to take less notice of any such financial penalties (witness the fiasco with the fines system). Perhaps reducing land development restrictions would encourage people to buy a house at a younger age and take some responsibility! It is also true that things which seem like a very bad idea the next morning, seem like a wonderful plan the night before, under the influence. This is just human nature, and is after all part of the point of having a few drinks. Without alcohol to lubricate our social lives, there would be many fewer marriages. We must encourage people to get a taxi when their drinking plans change, and pick the car up the next morning. Education is a good approach, through advertising and other means. This already happens. But with 139 in 140 drivers below the limit, I would argue that the message has already got through. Will the Police still be messing around with random stopping when 299 in 300 are below the limit? The focus on drink driving at these very low levels seems to me to be close to an obsession. Perhaps the Police could focus instead on activities which put them more in the front line, pitted against the low-life type that make our lives a misery. Burglary, anyone? Random breath testing is an abuse of the rights of the 12,000 people in North Shore who should have the right to drive home without being molested by the Police. It is time for a review. Sometimes people ask me what to do about the freezing weather we have been having during winters here and in the Northern hemisphere. I am forced to be honest and say that there is nothing you can do. Mother nature rules and we will just have to lump it. But some of the people who ask me are environmentalists. These are people who believe in global warming. And for them I have different answer. 6.5 Litre, V8 petrol, 215 Hp, this will use up your carbon credits very fast. Non lockable doors, you dont need to belong to the AA. No key, just a large isolate switch. Rear mounted radiator, there was no room to put it in the front . 39" super swamper tyres completely unbalanced. 6 speed auto, 2 speed transfer case, only slightly noisey. Twin 3" exhaust with short coby pipes, Very quiet at 350 metres. Air conditioning, the faster you go the colder it gets. Self cleaning windows, there are none. Heater, depends on how much you are wearing. Very economical when its not running. Dual steering wheels to look cool. got to look cool. Turning circle 2 1/2 large paddocks. In cab fire extinguisher for lucas wiring. Not ideal for wet weather, no windows or wipers. Not suitable for family trips, only two seats. Home to lots of spiders. The rust is a minor problem although it is getting lighter all the time as bits fall off. The vehicle has been built with the enviroment in mind, no trees were cut down and no snails were harmed. This is truely a collectors item, I collected lots of items to make it. 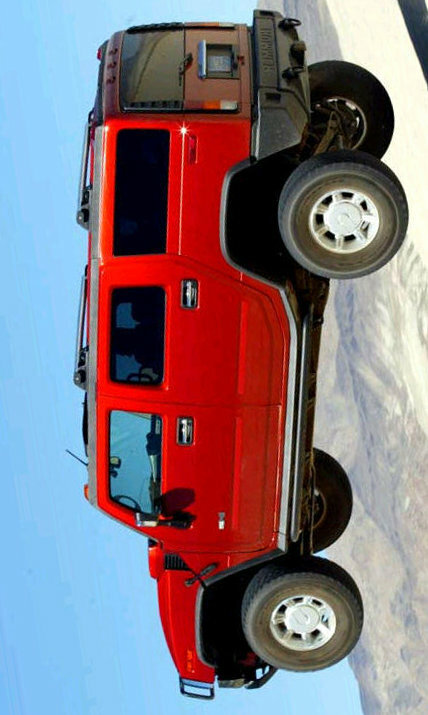 Would consider a new Hummer as part trade and cash difference. I realised that we are asking quite a bit of money for an old bucket of rubbish so we have sweetened the deal by painting it fire engine red, this has helped disgise the rust and looks cool too. This vehicle has been hand made by a craftsman with a large hammer, gas plant and welder. As you cruise down the road in one of these, you are probably helping global warming by at least 3 degrees. So, environmentalists, believers, disciples of the one true faith: stop rabbiting on about public transport. Do something useful and help prevent the next ice age! Those peak oil nuts are really looking stupid at the moment. Even I am starting to feel a bit sorry for them. I mean they were wrong, but even an optimist would struggle to predict oil prices this low. Now there is talk of prices heading towards US$25-30 a barrel, in other words right back to where they were before all this mania started. slip to 30 dollars per barrel level in the next three months. dollars, from 80 dollars previously, due to global economic slowdown. They might want to hire a new team. That sort of inaccuracy in forecasting makes the current team useless for any real investment decisions. Perhaps they have too many environmentalists on board? This plant was built on government compulsion. Taking myself for example, I do not want to use biofuels, nor pay the higher cost of these fuels. Biofuels put pressure on human food suppliers, and we can extract oil from the ground for less money and with less effect on food. So I don't want to but Mr McNicholl's product. capacity to produce 10 million litres a year. To the extent that Mr McNicholl enjoys sales, we are all the poorer. His business would not not really be gainfully employing 46 people. These 46 people would be costing us all money - their livelihoods would depend on our loss. 2012, would be scrapped under urgency. missing a chance to make New Zealand more economically independent. Really this is just silly legislation designed to give Mr McNicholl a free lunch. We need to be creating businesses that create wealth and that deliver benefits for New Zealanders. If Mr McNicholl's business relies on government compulsion, then we don't want it. It's about as much use as his web site, which has nothing on it. And while I'm on the topic, perhaps Solid Energy's CEO Don Elder might spend a bit more energy mining the billions of dollars worth of coal under his control, and ditch his 'Biodiesels New Zealand' investment. In case he hasn't noticed, the environmentalists aren't impressed. "The full efforts and resources of Air New Zealand will be focused over the coming days on providing support to the family members of the missing New Zealanders and to our people, and assisting in the investigation of the A320 accident in France," the statement said. Let's hope that after that, the focus will be on counting the number of paperclips in head office, and accurately measuring the weight of each plastic knife carried onto the planes. Anything would be more productive than wasting agricultural production on inefficiently growing something that can be extracted from underground ready made. Why grow oil when we have plenty of it? The flight is now due to go ahead in January, according to a written statement issued by the company this morning. Very sad news, but bittersweet if true that the Air NZ jet deliberately avoided hitting a village. At Tenerife in 1977, when a KLM 747 smacked into a Pan-American 747 on a foggy runway just before the Dutch aircraft lifted off the ground, it was human factor. The KLM skipper, the company's most senior pilot, was fed up with the weather delays and lined up for take off. Before he throttled up, he told his co-pilot he had clearance to roll. The co-pilot, very much the skipper's junior, asked him, doubtfully, "Have we got clearance?" The captain said he had heard the tower say so. The tower had said no such thing. The determination later was that such was the strict hierarchical structure within KLM, the co-pilot may not have felt he could contradict the senior man's judgment. At almost take-off speed, the Dutchmen saw the Pan-American aircraft crossing the runway and tried desperately to lift off but it was too late. Almost 600 people died. Now that's what I call impatient. The Christchurch City Council seems to have a streets department with a death wish. When not actually closing the streets they are supposed to manage, they spend lots of their time and our money narrowing them. Having managed to move the two kerbs on either side as close as possible to union, they then move on to reducing or banning parking, adding humps, and creating large areas of 'native planting' anywhere that they find a puddle. It is a crime that I have not highlighted this more on my blog. I promise to focus on it more, and be flogged if I don't. One thing that is annoying the lunatics at the council at the moment is people driving to work. In Merivale, a central suburb built around a small shopping mall, they find streets full of parked cars - the cars of those who work in the mall and surrounding shops and hospitals. The problem is made worse by narrow streets (many of which were 14m wide only 10 years ago and are now 5m narrower) which makes it more difficult to get out of driveways without hitting a passing car. Now, there is a plan to try to ban people from parking all day in Merivale Streets. The theory is that this will force them to take the bus. I have my doubts. There are plenty of jobs elsewhere in the city which don't require a long walk back to the car. There are plenty of outlying streets which will fill up instead. The council plans to continuously expand the parking ban, presumably until no one can park anywhere without a parking ticket. Anyway, who said we should force people to take the bus? It's those silly environmentalists again, isn't it? Leave us alone! Some residents have got together to stop this madness. By the council's own figures most residents oppose it. If the plan goes ahead Merivale residents in the streets will be the losers. We pay huge rates but the Council will be taking away our rights to park outside our own properties and in our own street. I think anything below $1.50 has to mean that the environmentalists raise the white flag. How about it guys? Petrol and diesel prices are at their lowest since May 2007, with Shell leading another price drop of 5c this morning. litre at Shell, with Gull, BP, Caltex and Mobil outlets following suit. Prices at Shell are now: 91 octane 148.9c a litre, 95 octane 153.9c and diesel 120.9c. Some of the slower environmentalists are still talking about peak oil. The smarter ones have given up that fight, for now. Global warming has more legs, so they will bang on about that one instead. One notable point is that the tax on petrol is now higher than the cost of the petrol. In other words, the government is making more money out of petrol than the arabs, oil companies, refineries, oil tankers, truckers and retailers combined. I hope the government is wisely saving up this money for a massive road building campaign, and not wasting it on public transport that no one wants. At this rate OPEC will have to halt production altogether to get the oil price to stop its slide. However, there is talk now of oil 'finding a bottom', which is a proctological term for 'it can't go any lower than this'. It seems that the price of oil may now stabilise, or even rise a bit, as things settle down in the markets. It isn't clear to me why anyone thinks that the markets are about to settle down though. Perhaps this is just wishfull thinking. Still, oil can't go a lot lower, surely. Anyway, enjoy filling up at the new lower price. If you are an environmentalist: tough luck guys, try global warming for a bit. I notice we're having a good warm summer - that must be worth a few headlines. 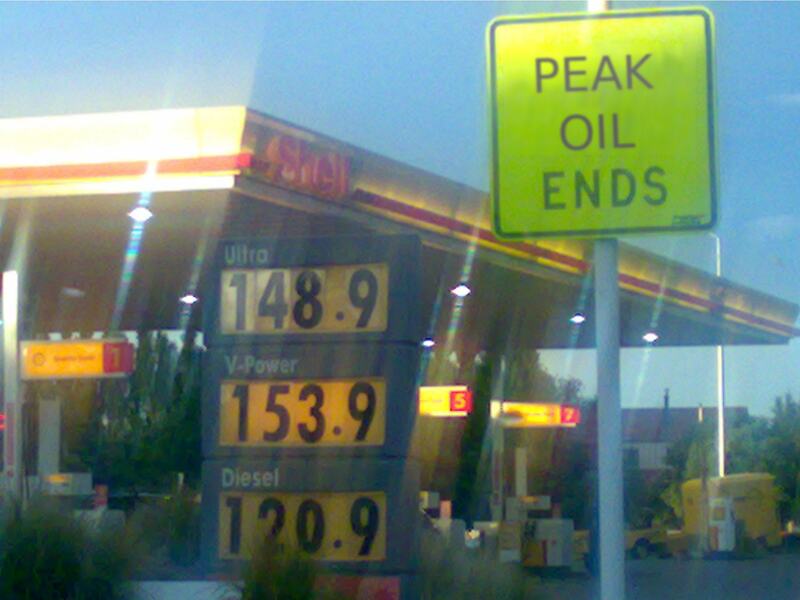 Poneke says the price has fallen 70 cents below peak oil. I like the terminology! The news for environmentalists on the oil side just keeps getting worse and worse. Now it is down to $56, which is almost cheap. At this price a number of new-age exotic oil producers will have to think about shutting up shop. If this is peak oil, the peak is upside down. It must be excruciatingly embarrassing for environmentalists who have claimed that peak oil has already happened (in 2007 in fact) and that we are now on the downward slow of running out of oil. Of course you can mess around with vast amounts of analysis if you like but the fact it there is no peak oil. I can hardly image the pain of being so completely and utterly wrong. for a smooth transition. Hence the economic upheavals have begun. There I was thinking that it had already happened, and there was nothing we could do to stop it. But no, it won't happen for 5 years and justifies that by saying that it's still a crisis, because it will take 20 years to respond. Excuse my scepticism, but What A Load Of Crap. The leaked IAE report referred to has now come out. It says that there is no sign of peak oil before 2030! That is more than 20 years away. It is so far away that we needn't even think about it. World oil supply is projected to rise to 106 million barrels a day in 2030 from 84 million in 2007, with the bulk of the increase expected to come from members of the Organization of Petroleum Exporting Countries. The message is that oil supply will continue to increase for another 20 years. Beyond that, assuming we still want the stuff, my bet is that it will go on increasing after that too. Environmentalists need to grow some honesty and admit that peak oil is scam. A comment on my recent peak oil post deserves fuller treatment, so here it is. Your dismissal of Peak Oil is naive and confuses demand destruction of oil by global economic recession with ample and increasing oil supplies as the cause of the precipitous drop in oil prices. This is not a case of confusion. My point is that the price of oil is based on demand and supply (and speculation on what the future of that will hold). The market looks at all the information available and makes a decision on what price the oil is worth. When the price of oil was rising fast, environmentalists were quick to revel in the gloom of rising prices and attribute them to oil running out. Therefore when the price collapses, it is only fair that pro-humans should revel in the wonder of unpeaked oil. The former is fact the latter is fiction. The reduction in demand is real enough and this is why we are all having a good laugh at the moment at OPEC's attempts to predict demand. But as I have pointed out, there is no let-up in the finding of new potential oil fields. In fact there appears to have been an explosion of new finds in the past few years, precisely because the price has been so high. The idea of peak oil depends on there being no new oil, and running out of the old stuff. Neither of these is true. Peak Oil pundits have long predicted precisely the decline in oil prices caused by economic recession attributed in part to higher energy prices triggering the default of sub-prime mortgages and the realization by finanicial institutions that their loans and business as usual model is not valid in the face of higher energy prices and stagnating oil production rates. Actually the price of oil has not caused the economic recession. The recession is much more related to the amount of debt about and has been coming for years. Rich countries are much less dependent on the price of oil for their economic growth than they were 30 years ago. In fact the recent rise in prices didn't really even qualify as an oil shock. As for the thought that the price of oil changes entire business models, what? Where? If anyone was silly enough to make decisions based on a few years of higher oil prices then they will be feeling foolish now, and even more foolish if OPEC don't manage to cut production fast. Oil production rates are not stagnating - see my previous graph on this topic. Having said that OPEC has cut production, but not because they are running out, but because they want the price to go up. Furthermore, the drop in oil prices has caused concern and alarm in the oil industry which will naturally retard - not enhance - continued oil development. Of course this is true, although $60 is still a reasonable amount of money for a barrel of oil. The Saudis pull it out of the ground for about $2. Oil companies have made bumper profits recently, and have invested some of that. These projects may slow at $60 a barrel, but most are viable at that price. The only worry for oil companies is that oil drops to $10 again. Having said that, with 40 years of reserves sitting in the bank, so to speak, it doesn't make sense to look too hard for new oil, unless it is significantly cheaper to extract that from existing wells. Non-conventional oil projects and alternative energy projects will also be slowed, deferred and cancelled. Yes indeed they will, but they have hardly had an impact on the oil supply market anyway. What the price peak has proved is that at $100 a barrel you can squeeze oil out of marshmallows and still make a profit. All sorts of bizarre schemes have been cooked up. Of course some of these will now fade away. But if the price were to rise again, they will come back. 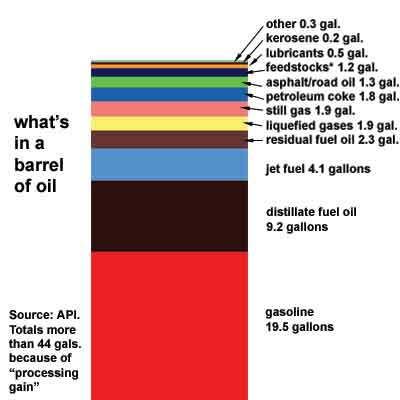 This is precisely why the price can never get too high - there is ample oil at $10 a barrel, and at $100 a barrel there is more than we could ever imagine using, from the likes of tar sands, shale, etc. Consequently, when the World's economies once again find sound financial footing and strong growth, the oil & other energy supplies will not be there to meet demand which will cause the price to eclipse the $147 per bbl high achieved earlier this year. Just watch. Of course I will watch, hence my post. But you are sadly deluded. The market has learned its lesson about peak oil and won't make the same mistake for many many years. Peak Oil is alive and well and there is no valid evidence to the contrary. It should be clear to most observers that peak oil is not so much a natural phenomenon as a man-made one. Oh dear this is a bad time to be an environmentalist. How low does petrol have to go before they will admit that peak oil is a scam? My prediction: not until it hits 80 cents a litre (i.e. the petrol stations give it away and all we pay is the tax). boost prices - last week the cartel cut output by 1.5m barrels a day. barrels a day and set a minimum price target of $70 or $80 a barrel. The producers are still operating under the illusion that they set the price of oil. They have some control, but there are many factors out of their control, like world demand (which depends on energy mix and economic growth) and speculation (which depends on the price and prospects of other unrelated assets). Just a few hours, and they caved! That's what I call market pressure. In most government departments they wouldn't have been able to call a meeting until a week later when all their customers had deserted. Those who believe in peak oil are really having trouble. Not only is oil bubbling up all around the world at an amazing rate, but production hasn't dropped either. Here is a graph showing production from 1965 to 2007. It is clear from the above that production didn't rise to 1979 levels until 1993. No doubt there was huge amounts of discussion about peak oil then, right? Well perhaps not. If there was, those involved would be feeling very foolish with production now 23% higher than then. It is also clear the production wobbles around a bit. The high prices in the 70s may have contributed to the growth in production, as may have also happened since about 2000. Some people point to the last 2 years and say that production hasn't moved much (the numbers are 80.3	81.2	81.6	81.5) as evidence of peak oil. Given the way it wobbles around, this is profoundly unconvincing. Let's see how the graph looks in 2010. The environmentalists point to anything that moves and call it 'Peak Oil'. In fact, they are now claiming that the dramatic drop in price is caused by Peak Oil! This is in addition to their claims that the dramatic rise in price was caused by Peak Oil. As I’ve noted previously the dramatic falls and rises in price are indication that we are hitting peak oil. Next I expect that environmentalists will claim that Peak Oil is causing the changing of the seasons. Back in the real world, which you and I actually live in, we can see that oil reserves are on the way up. I did this little graph which is interesting. 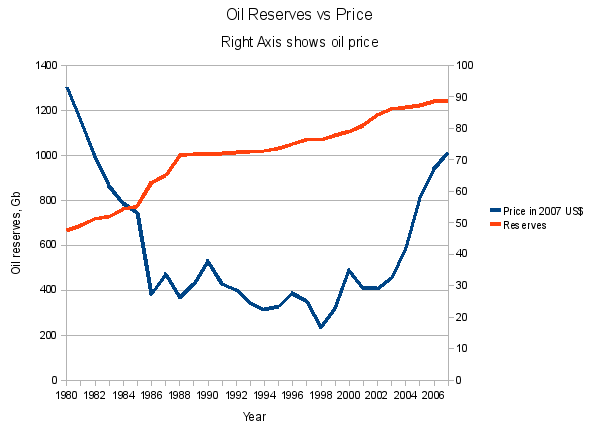 It shows the total oil reserves since 1980, along with the price (in current US dollars). As you can see, reserves have been growing all the time. This is despite the fact that we have been using an ever-increasing amount of oil each year. How can it be that using more creates more? Economists would tell us that the total reserves is only an estimate based on the value of oil and the resulting amount of effort that people have put in to find it. With around 40 years of oil in the bank, it doesn't make a lot of sense to invest money to find more, unless of course the newly found oil is very cheap to extract. So what we are seeing is probably that companies find more oil as and when it is needed. The reason for price on the graph is because price is a significant determiner of the amount of effort that is put in. In 1998 with oil at $10 a barrel no one in their right mind was looking for more. It was obvious to all but the environmentalists that no one wanted oil and there was plenty of it anyway. The rise in oil prices since 1998 has changed that view. Oil men are cynical old bastards, but even they have been caught up in the excitement of oil going over $100 a barrel, and predictions of oil going back down to $10 a barrel are few and far between. Oil exploration has slowly started up, gathering pace and urgency as the price rose. Sadly it can take 10 years from finding oil in the ground to actually shipping it, so this process does not produce immediate results. And now that the price has dropped back, there will still be some inertia and many projects will still complete, to provide the oil we need in the next decade or so. So there is a strong relationship between price and oil exploration, and I believe it is possible to see that in the graph above. From about the mid 1980s the price falls back to 'normal' levels and the reserves increases seem to drop off a bit. Given the lag, I believe we could be about to see an increase in reserves again due to the last 10 years of higher prices. If and when the above are proven, they will increase reserves by about 369 billion barrels, or around 10 years of supply. To see that peak oil is a scam, environmentalists need to understand only one thing about economics: price influences supply. As I never tire of saying, the stone age did not end due to lack of stone, and for that matter the coal age is fading in New Zealand while we still have 2000 years of coal in the ground. The oil age will not end due to lack of oil. cancelled because of line maintenance. I don't understand 'briefly cancelled'. Either something is cancelled or it isn't. Or did they say for a brief period that it would be cancelled, but in fact then it wasn't? That's the problem with public transport - no information. Anyway the upshot is that Sue Kedgley was late for the launch. Now she wants us all to use public transport so we can be late for our things also. "Currently, the Government spends only 20 cents on public transport for every $1 it spends on roads." Of course, the Government spends almost nothing on roads. It collects almost the entire budget in road taxes. On the other hand, the Government collects almost nothing from public transport. The project would cost half that of Transmission Gully. And would benefit a tiny fraction of the population whereas Transmission Gully will benefit most. To drive up congestion? The official speed limit is already too low, and even that is rarely achieved on arterial roads. The Green Party wants a light rail system to run all the way through Wellington out to the airport. Excellent, we can be late for flights too. caught in the bus replacement but we still got her into Wellington." What hope for us mortals when the gods of public transport can't get there on time? Another Massive Oil Find: Where is Peak Oil? The environmentalists are still talking about Peak Oil even though the price of oil has fallen by half in the past few months and it seems certain that the previous rise was partly due to speculation and uncertainty in other markets. It estimated the oil available from just 10 percent of the area was 12.6 billion barrels. This is enough to keep New Zealand in oil for 250 years, and adds to the 2000 years of coal we have already found. The Peak Oil scam is getting harder and harder to argue. remote “dormitory” communities, to reduce travel needs. The 'subsidies' they refer to are presumably the 80 cents per litre petrol tax. How this is a subsidy is beyond me but then I don't have a degree in voodoo economics. Stopping free parking is a great way to stop shopping if they really want things to fall over in a hurry. The scary thing is that this guy is apparently a 'Senior North Shore City transport strategist'. I think that means he is a council employee. What right does this bloke think he has to tell us how to get about? He needs to pull his head in and start working out a way to delivery council services for less money. Anyway, good new on the oil find. Get drilling guys. You know our economy needs the money. Oh dear this must be very hard for the environmentalists. Peak Oil? What a load of rubbish. There are boat-loads of oil springing up all over the world. But for government taxes, petrol would be under $1 now. Still, their loss is our gain and we can enjoy a slightly cheaper fill-up while environmentalists cringe with embarrassment! I have to wonder when environmentalists will come out and admit that Peak Oil holds no water? Is it such a religious argument that no price is too low for this to happen? Prices are still fairly high, so we will see. Hopefully that will be the end of this garbage about Peak Oil. Of course, environmentalists will still go on about it, but the rest of us will now see it for what it is. A scam, like all the other environmentalist scams. Note that the US$ is much weaker now than a year ago so the real drop in oil price is much more. By the way, the Herald complains that we pay too much for petrol. Converting this to NZ$, crude oil was about NZ$97 a barrel a year ago and is about NZ$118 now. There have been no tax cuts. Therefore we are lucky to have the price we have, I think. I know which is more useful. to peak plywood, after all.